Boosting one of the best trails for young children in Michigan, Besser Natural Area is a small preserve that forms the north end of the Rockport Recreation Area. 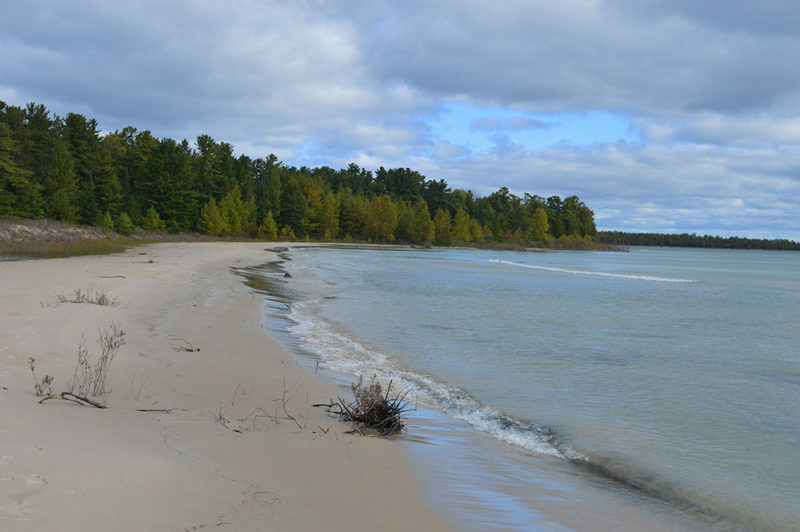 Along with giant pines, the natural area contains a ghost town, a shipwreck and more than 4,000 feet of Lake Huron shoreline including a small cove whose wide, sandy beach is ideal for a cool dip on a hot summer day. The natural area is named after Jesse Besser, founder of a massive concrete block corporation in Alpena. In 1966, the industrialist gave to Michigan this 134-acre tract because it contained a magnificent stand of virgin red and white pine that somehow escaped the swinging axes of lumbermen in the 1800s. 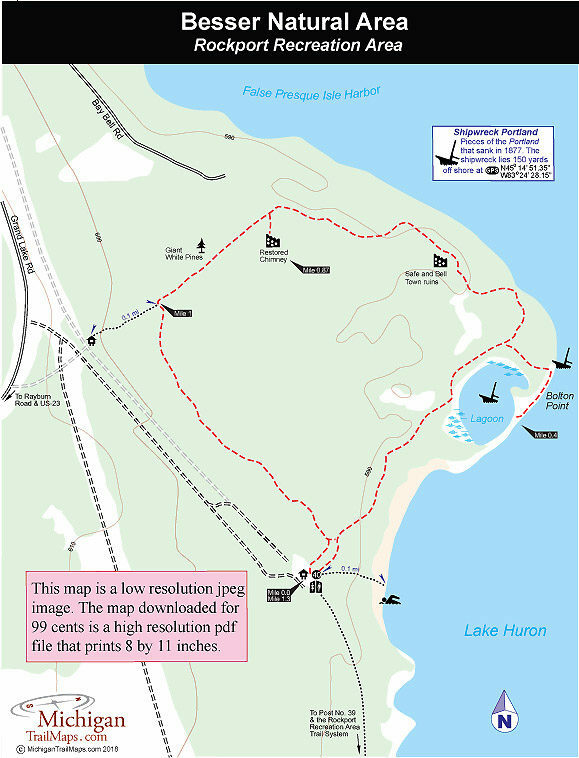 In 2012, Besser Natural Area became the north end of Rockport Recreation Area when the 4,237-acre state park that borders Lake Huron in was officially dedicated. 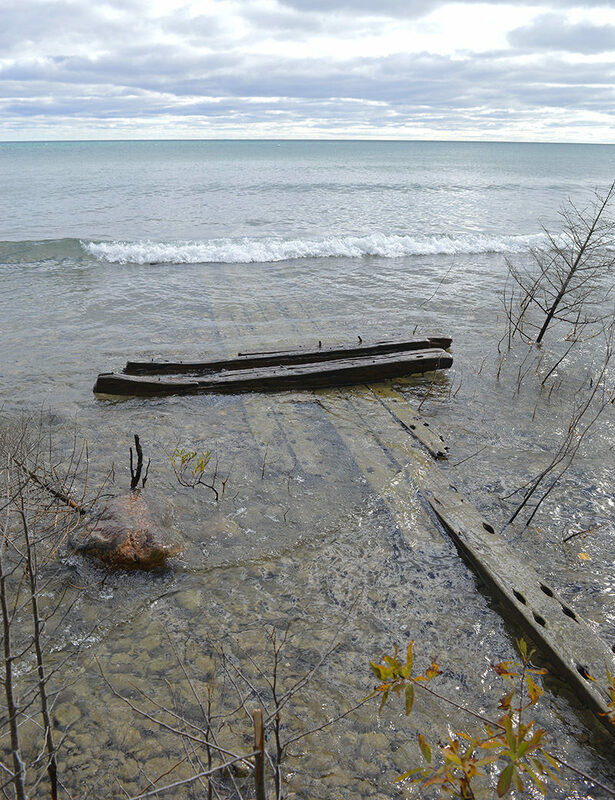 The trail at Besser is a 1.1-mile loop along with a side trail to look for shipwreck pieces. The entire hike is only 1.3 miles but within this short distance are remains of the town of Bell, a beach and giant pines. Bell was settled in 1880 and at its heyday had a population of more than 100 and contained several homes, a sawmill, a saloon, a store, and a school. It was abandoned around 1915, but the collapsed walls of a building, a cemetery with a large headstone and a towering stone chimney remain. In the parking area, the main trail is marked by post No. 40 while nearby a spur heads east to the Lake Huron. Most of the shoreline in the natural area is composed primarily of limestone gravel, but the short side trail leads to the cove formed by Bolton Point to the north that has created a delightful place to swim. The loop heads north and quickly arrives at the return trail marked by a large wooden display map. Head right, and within a quarter mile you pass the lagoon and comes to a junction with a spur that extends east to Lake Huron. 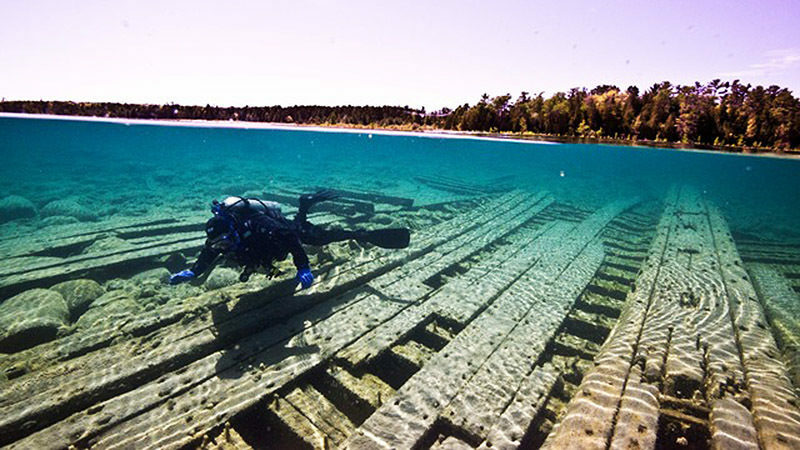 Along the way to the Great Lake, you pass a few pieces of a shipwreck and then arrive at the rocky shore where a large section of the boat is half-in, half out of the water. The pieces here and in the lagoon belong to the Portland, a 150-foot long wooden schooner that was built in New York in 1863. The schooner ran aground just offshore from the town of Bell during a fierce October storm in 1877 and as it is so often the case was quickly torn apart by raging waves. The bilge and starboard side of the wreck lies in 6 feet of water, 100 yards offshore. The stern and portions of the portside hull are located in the pond that was once part of the bay, but over time became separated by a buildup of sand and rock. Follow the rocky beach south to reach the backside of the lagoon at Mile 0.4. The best way to see this portion of the Portland is to slip on a pair of polarized sunglasses and stand on the of the edge of the east side of the lagoon. From here the wreck is in the middle of the pond in four feet of water. Too much sun or wind will make it almost impossible to spot. Retreat to the junction along the main loop and continue north (right). Within a couple of hundred yards, the trail passes ruins from the town of Bell. 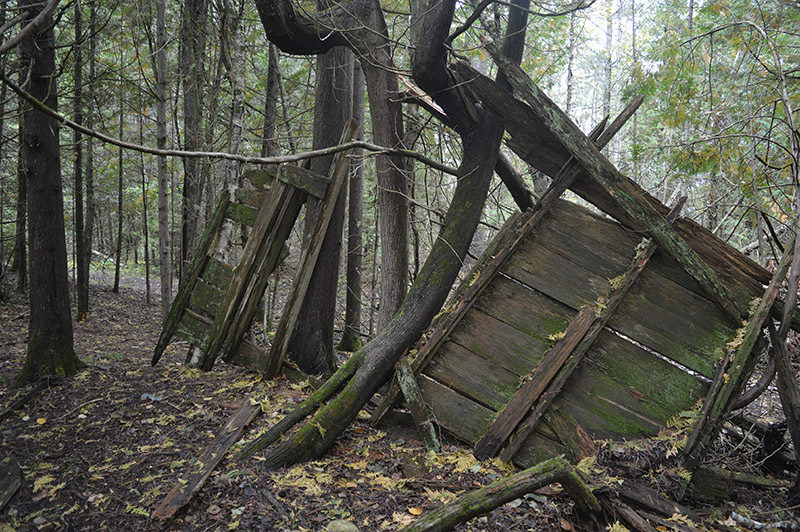 This village was settled in 1880 and survived on logging and brickmaking until it was abandoned around 1915. The ruins here are the collapsed walls of a building whose steel safe and icebox counter indicates it might have been either a saloon or a general store. At Mile 0.8 a spur heads south to a lone chimney leftover Bell's heyday and restored in 1975 by the Youth Conservation Corps. At this point, the loop begins to head south quickly passes through the most impressive timber along the trail. The stand of old growth of red and white pine are all so stately and tall that young necks strain to see the arched boughs at the tops. Surrounding the trees are large spruce, balsam, cedar, and birch. At Mile 1 you pass a junction with the spur that heads west to the winter parking lot and within a third of a mile, you're back at the trailhead. 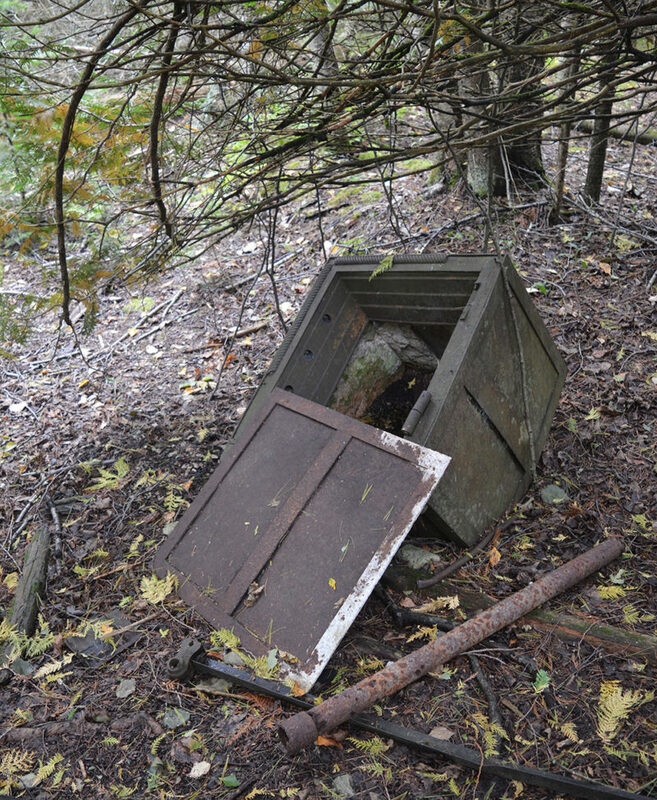 There is little at the trailhead other than a vault toilet. There is no drinking water. Depending on the age of your party, plan on 20 to 40 minutes to walk the trail or, better yet, make it an afternoon adventure by bringing lunch and swimsuits for enjoying the beach. Besser Natural Area is open year round and there is a separate trailhead and parking area for winter use. An annual Recreation Passport or a state park is required to hike the trail. 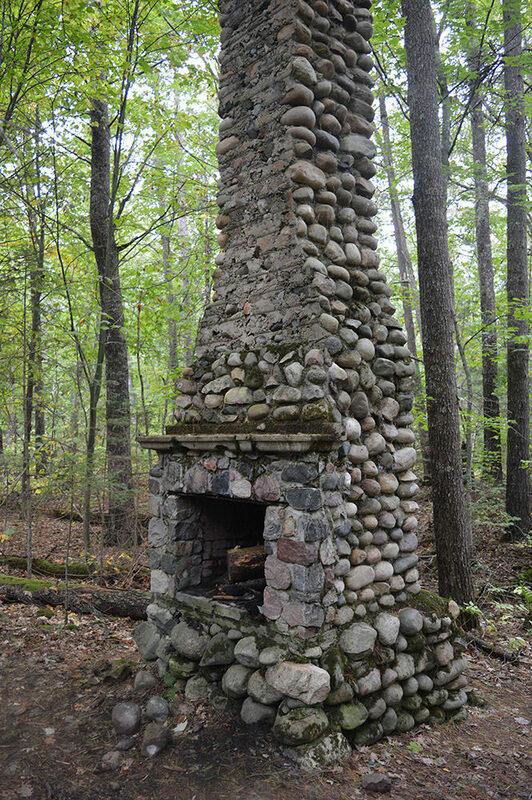 The somewhat remote natural area is a 20-minute drive north of Alpena and reached by departing US-23 east onto Rayburn Road and following it 1.8 miles to the posted entrance. As part of Rockport Recreation Area, contact P.H. Hoeft State Park at 989-734-2543 for more information.